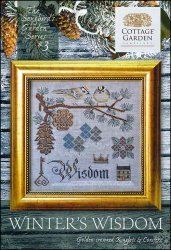 Songbird Garden Series 3: Winter's Wisdom [H1001] - $9.00 : Yarn Tree, Your wholesale source for cross stitch supplies. Cross stitch pattern from Cottage Garden Samplings. It's a cold winter day. Two beautiful birds stand on a tree branch decorated with pinecones. A key, house & crown are stitched below the birds. Needing a little wisdom this winter? "Winter's Wisdom," is waiting for you! Stitch count 159w x 159h.